In the wake of a close electoral race launched hastily after Hugo Chavez’s death in March, Venezuelan president Nicolas Maduro finds himself facing a nation taut from the reactionary smoke-and-mirrors conflict surrounding the legitimacy of his 1.8% margin victory. “Take all of your hatred out, all your frustration, in the name of peace,” he said. A state of confusion and hostility erupted Monday evening, April 16. Many public hospitals and institutional buildings were set ablaze, and nine civilians were killed in working-class neighborhoods associated with chavismo. Among the victims were two children, ages 11 and 12, run over by a truck that swerved purposefully into a celebratory procession for Maduro. Hundreds of chavista homes were attacked and threatening messages were spray-painted across windows and doors. In an interview last weekend, President Barack Obama elaborated on the White House refusal to recognize Maduro’s presidency—while countries such as Spain and France joined him at first, he now finds himself alone. To hit home his point, he lauded the recent Mexican elections’ “peaceful transition—” ignoring the blatant electoral misconduct and censure of dissenting voices that sparked the international #YoSoy132 movement. Venezuela customarily audits a random 54% of the paper ballots to confirm the validity of its elections. Though both parties participated and found no irregularities, that wasn’t enough for White House press secretary Jay Carney. Parroting Capriles’s demands, he said that a 100% audit was “an important, prudent, and necessary step” to eradicate the notion of fraud. Calculations by David Rosnick of the Center for Economic and Policy Research counter that sentiment. The odds that the remaining 46% could reverse the outcome are 1 in 25 thousand trillion, he found. 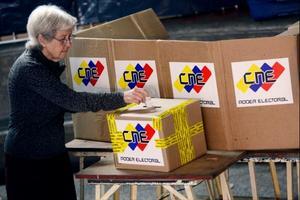 To keep the peace, the National Electoral Council (CNE) eventually agreed to audit the remaining ballots. White House demands on a sovereign country triggered outrage, and Secretary of State John Kerry’s reference to Latin America as Washington’s “backyard” didn’t help. On May 1, Bolivian president Evo Morales banished USAID—a government “humanitarian” group—to protest the implicit contempt. WikiLeaks recently intercepted a 2006 cable sent by William Brownfield, former ambassador to Venezuela and current Assistant Secretary of State. In it, USAID was listed as one of a handful of organizations dedicated to promoting five core objectives: penetrating Chavez’s political base, dividing Chavismo, protecting vital U.S. business, and isolating Chavez internationally. As Chavez’s handpicked successor, Maduro is now in the crosshairs. While one Venezuelan marketing advisor, J.J. Rendón, has refused to confirm his involvement in Capriles’s 2013 campaign, his fingerprints are all over the game plan. That was just the opening salvo, said Freitez. Confronted with a nation reeling from the loss of its leader, Capriles blamed former vice president Maduro—rather than the beloved Chavez—for the shortcomings of the previous administration. 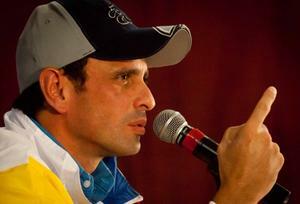 Capriles also benefited from pollsters’ exaggeration of Maduro’s margin of victory, which encouraged his supporters to stay home. James Clapper, U.S. Director of National Intelligence, corroborated these estimates, forecasting Maduro would win by a comfortable margin. But 1.8% is hardly comfortable. It indicates that 700,000 people who voted for Chavez ultimately voted for Capriles this time around. This loss can be attributed to many different factors, the simplest being that while Maduro had been overshadowed by the colossal charisma of his predecessor—Capriles still had his campaign apparatus in place and had an established public persona since the 2012 race. The increasing cycle of violence was also a leading issue in the campaign, often accredited to Chavez’s more preventive—less punitive—ideologies regarding crime. A relentless media campaign continues to widen the class divide. Chavismo is equated with poverty, embarrassing even some who benefit from it. The Venezuelan elite embraces the fairytale of pulling oneself up by the bootstraps, nostalgic for a time when inequality reigned. The United Nations praised Chavez for his literacy, housing, and healthcare initiatives which, they said, cut poverty in half. By some accounts, the voting population could increase by as much as 25% in the next three years—a stretch in which Maduro will face a steep learning curve. His challenge will be to light a fire under the new generation by providing historical perspective. When the remaining ballots are counted by June 4, social justice and Latin American solidarity could hang in the balance. Zoë Clara Dutka is an independent journalist and photographer currently based in San Francisco. She lived in Venezuela from 2008 to 2012.